Ponte Morandi (English: Morandi Bridge), officially Viadotto Polcevera (English: Polcevera Viaduct), is a road viaduct on the A10 motorway in Genoa (Italy). It is managed by Atlantia S.p.A. (formerly Autostrade S.p.A.), a holding company operating toll motorways and airports controlled by the Benetton family. Located on one of the major links from Italy to France and part of the European route E80, the viaduct links the Sampierdarena and Cornigliano districts of Genoa crossing Polcevera valley. It was built between 1963 and 1967, costing ₤3.8 billion and opened on 4 September 1967. It was widely but unofficially named "Ponte Morandi" from its designer's name, civil engineer Riccardo Morandi. The official name comes from the river Polcevera that runs under the bridge. On 14 August 2018, a partial collapse blamed on corrosion in the cable stays killed 43 people who were crossing the bridge at the time. The disaster caused a major political controversy about the poor state of infrastructure in Italy, and raised wider questions about the condition of bridges across Europe. It was later decided that the bridge would not be repaired but demolished. Demolition began in February 2019. The bridge was designed by Riccardo Morandi. It is similar to his earlier 1957 design for the General Rafael Urdaneta Bridge in Venezuela, except for the stays, which in the Venezuelan bridge are not covered with prestressed concrete. The Ponte Morandi is a cable-stayed bridge characterised by a prestressed concrete structure for the piers, pylons and deck, very few stays, as few as two per span, and a hybrid system for the stays constructed from steel cables with prestressed concrete shells poured on. The concrete was only prestressed to 10 MPa, resulting in it being prone to cracks and water intrusion, which caused corrosion of the embedded steel. The viaduct was built between 1963 and 1967 by the Società Italiana per Condotte d'Acqua. It had a length of 1,182 metres (3,878 ft), a height of 45 metres (148 ft) at road level, and three reinforced concrete pylons reaching 90 metres (300 ft) in height; the maximum span was 210 metres (690 ft). It featured diagonal cable-stays, with the vertical trestle-like supports made up of sets of Vs: one set carrying the roadway deck, while the other pair of inverted Vs supported the top ends of two pairs of diagonal stay cables. 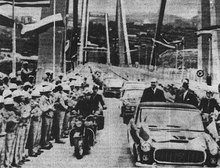 The viaduct was officially opened on 4 September 1967 in the presence of Italian President Giuseppe Saragat. The bridge had been subject to continual restoration work since the 1970s due to an incorrect initial assessment of the effects of creep of the concrete. This resulted in excessive deferred displacement of the vehicle deck so that it was neither level nor flat; at the worst points, it undulated in all three dimensions. Only after continual measurement, redesign and associated structural works was the vehicle deck considered acceptable, approaching horizontal by the mid-1980s. In a 1979 report, Morandi himself recommended: "remove all traces of rust on the exposure of the reinforcements, fill the patches with epoxy resin, and cover everything up with elastomer of very high chemical resistance". In the 1990s, the tendons on pillar 11 appeared to be most damaged. About 30% of the tendons had corroded away. The load of the bridge was 7000 kg per tendon, while the tendons were originally capable of carrying 15000 kg. A single truck can weigh as much as 44000 kg. As of the collapse of the bridge, only pillar 11 had been internally inspected in the 1990s, showing severed and oxidized strands. From 1990 onward, the easternmost pillar 11 had its stays strengthened by flanking them with external steel cables. Pillar 10 had the stays at the top strengthened with steel sheathing in the 1990s. Following the collapse many questions have been raised about the stays. In 1979/1980, Morandi's similar bridge in Venezuela suffered one or more stay cable failures with collapse imminent. The former Italian Minister of Infrastructures and Transport Graziano Delrio, who was in charge until 1 June 2018, was informed several times during 2016 in the Italian Parliament that the Morandi Bridge needed maintenance. In Genoa, in 2017, a confidential university report noted disparities in the behaviour of the stays of the now collapsed pillar 9. The minutes of a February 2018 government meeting reported that resistance and reflectometry measurements had been performed indicating an "average" reduction of the cross section of 10 to 20% of the tendons. A crack in the road had appeared at least fourteen days before the collapse, near one of the southern stays of the now collapsed pillar 9. The crack may have indicated that the stay had stretched. At no point was there a suggestion to reduce the load on the bridge. Traditionally, bridges were only designed for a 50-year life span. On 3 May 2018, the Autostrade Company had announced a call for tenders for a structural upgrade of the viaduct to the value of €20,159,000, with a deadline of 11 June 2018. The work on the reinforcement of the stays on pillars 9 and 10 would have needed to be finished within 5 years. Workers were installing new heavy concrete Jersey barriers on the Ponte Morandi before it collapsed, reducing the already low compressive pre-stress on the concrete of the stays and increasing the loads. In 2017, Carmelo Gentile and Antonello Ruccolo of the Polytechnic University of Milan studied the modal frequencies and deformations of the stays of the bridge. On pillar 9 they could only identify 4 global modes, and the deformations of two of these identified modes were not fully compliant. Modal frequencies were more than 10% different, specifically on the southern stays. In pre-stressed concrete beams such a difference can represent the entire effect of the non-linear pre-stresses. As little as a 2% shift could represent severe damage. The pre-stress in the Ponte Morandi has been characterized as relatively small from the start. In contrast, for bare tendons which are relatively under-constrained such as the strings in a piano, the effect of pre-stress is dominant in determining the resonant frequency. Other than pre-stress, changes in geometry, such as corrosion in the tendons could impact the resonance frequency. The effects would be reduced by the composite nature of the stays when observing global modes. Gentile had performed similar modal analyses on pillar 11 in the 1990s. Other related methods were applied on the stays of Ponte Morandi in the 1990s such as reflectometry, which was able to measure the tension but not strength of the tendons. In the 1990s the bridge had shown signs of weaknesses. At this point material support was added. Rust on metal materials of the bridge became more evident since then. In 2013, fears were expressed that the structural condition of the bridge was poor. Warnings that the bridge was in danger of collapse were dismissed by the Five Star Movement as a "fairy tale" on their website. In 2016, the bridge was characterised by Antonio Brencich, a Professor of Structural Engineering at the University of Genoa, as a "failure of engineering", mainly due to high maintenance costs. 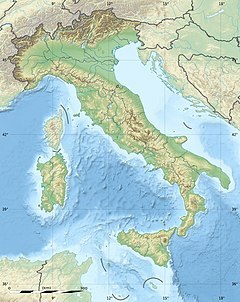 Location of the collapse, which resulted in the A10 motorway being severed and the closure of the railway lines from Genoa to Milan and Turin. On 14 August 2018 at around 11:36 local time (09:36 UTC), during a torrential rainstorm, a 210-metre (690 ft) section of Ponte Morandi collapsed. This was centered on the westernmost pillar 9 which crossed the Polcevera river as well as an industrial area of Sampierdarena. Eyewitnesses reported that the bridge was hit by lightning before it collapsed. Between 30 and 35 cars and three trucks were reported to have fallen from the bridge. A large part of the collapsed bridge and the vehicles on it fell into the rain-swollen Polcevera. Other parts landed on the tracks of the Turin–Genoa and Milan–Genoa railways, and on warehouses belonging to Ansaldo Energia, an Italian power engineering company. The latter were serendipitously largely empty because the collapse occurred on the eve of the Italian public holiday, Ferragosto. The initial hypotheses were that a structural weakness or a landslide caused the collapse. The bridge was reportedly undergoing maintenance at the time of the collapse, including strengthening the road foundations. It has been reported that the southern stays gave way explosively due to corrosion and damage. With only four stays, one of them giving way might have been enough for the structure to lose stability. A preliminary investigative report suggested the pillar itself may have collapsed first, but Genoa prosecutors had not provided the authors with a local video showing the southern stays gave way first. There is speculation that lightning may have struck the stays, or a landslide could have destabilized the base. According to Corriere della Sera, this was the 11th bridge collapse in Italy since 2013. Forty-three people were confirmed dead and sixteen injured. The dead were twenty-nine citizens of Italy, four from France, three from Chile, two from Albania and one each from Colombia, Jamaica, Moldova, Peru and Romania. Multiple survivors were transported to nearby hospitals, many in critical condition. Davide Capello, the former goalkeeper for Cagliari, survived without injury and was able to walk away from his car, even though it dropped 30 metres (100 ft) before becoming wedged between parts of the fallen bridge. The area under the remaining part of the bridge, including several homes, was evacuated. As of 02:00 the following day (midnight UTC), twelve people were known to be still missing, and voices could be heard calling from underneath the debris; rescue efforts were continuing by floodlight using techniques commonly deployed after earthquakes. The railways connecting Genoa Sampierdarena (and Genoa Piazza Principe) with Genoa Borzoli and Genoa Rivarolo were closed immediately as a result of the bridge's collapse. A bus replacement service was established between the stations. The day after the collapse, Prime Minister Giuseppe Conte declared a state of emergency for the Liguria region, which would last for a year. According to Deputy Minister of Infrastructure Edoardo Rixi, the entire bridge will be demolished. The Italian Football Federation announced that a minute of silence would be held for the victims of the collapse before all football events across the country during the weekend that followed the incident. On 16 August, the Lega Serie A postponed the opening 2018–19 Serie A matches for both Genoese association football clubs Genoa and Sampdoria that were originally scheduled for 19 August. The Italian Transport Minister Danilo Toninelli (in office – for the first time – since 1 June 2018, but exponent of political party which in 2012 – reporting technical valuations by Autostrade from 2009 – said that the risk of a collapse of Morandi Bridge it was just a silly fairy tale and that the bridge would have lasted another hundred years) described the incident as "an immense tragedy". Governor Giovanni Toti said that the loss of the bridge was an "incident of vast proportions on a vital arterial road, not just for Genoa, but for the whole country". The disaster resulted in a drop in the stock price of the road's operator, Atlantia, by 5% the same day and by 25% two days later. A state funeral was held on 18 August, inside the Fiera di Genova event arena, for 18 victims of the collapse, along with recognition for the firefighters and other rescue workers. Some of the victims' families refused to attend the service and instead hosted private funerals. The funeral was attended by Italian politicians such as President Sergio Mattarella, Prime Minister Giuseppe Conte, Interior Minister Matteo Salvini, Transport Minister Danilo Toninelli, and Secretary of the Democratic Party Maurizio Martina. The collapse raised concerns about the general condition of infrastructure in Europe, with studies in Italy, France, and Germany suggesting that a significant number of bridges are in need of renovation or replacement due to corrosion and structural deterioration. Infrastructure investment in Italy was reduced dramatically after the 2008 financial crisis. A resident of Genoa told reporters: "The central government will scapegoat the bridge company, the company will scapegoat someone else — they're all to blame. We all know how bad our infrastructure is in Italy." The ruling coalition put pressure on managers of the road, Autostrade per l’Italia (who are part of the Atlantia group). Deputy Prime Minister Luigi Di Maio claimed that they were "definitely to blame." Minister of the Interior Matteo Salvini also blamed supposed EU spending limits for infrastructure, but this was immediately dismissed by EU officials. The position of the Benetton family, whose company owns 30% of Atlantia, has also come under view. Autostrade per l’Italia's chief executive, Giovanni Castellucci, said that the bridge would be rebuilt within eight months. The investigative committee was to be chaired by Roberto Farrazza and to have as an expert member Antonio Brencich. However, these two committee members were immediately criticized for being among the signers of the February 2018 government report that failed to impose precautionary measures on the weakened bridge. On 23 August 2018, Brencich resigned from the inspection commission, and Minister Danilo Toninelli removed Ferrazza as the chair, for "reasons of opportunity in relation to all the institutions involved in this affair". A Volvo FH truck 12 380 belonging to Damonte Trasporti S.R.L. and in services for Basko Supermarket, painted in blue and green, became a widely publicized symbol of the disaster because it remained standing almost at the edge of the collapsed section. The 37-year-old driver at the time of the accident recounted to the media how he looked in shock as the bridge busy with dense traffic collapsed in front of him, as he brought his vehicle to a stop and ran back until he reached firm ground. ^ "Genoa Bridge Collapse Throws Harsh Light on Benettons' Highway Billions". The New York Times. 5 March 2019. Retrieved 5 March 2019. ^ "La storia del Ponte Morandi: un tempo avveniristico, ma non mancavano criticità". GenovaToday. Retrieved 19 August 2018. ^ "Crollo Genova, trovato l'ultimo disperso sotto le macerie: è l'operaio Mirko. Muore uno dei feriti, le vittime totali sono 43". la Repubblica. Retrieved 21 August 2018. ^ "Demolition of Genoa's Ponte Morandi is underway". domusweb.it. Retrieved 16 March 2019. ^ General Rafael Urdaneta Bridge is located at the outlet of Lake Maracaibo in western Venezuela. It partially collaps in 1964 when the tanker SS Esso Maracaibo – out of control due to a major electrical failure onboard – collided with 2 piers of the not stayed section of the bridge. ^ "Cable stayed bridges" (PDF). pci.org. 1973. ^ Frangopol, Dan; Sause, Richard; Kusko, Chad (7 July 2010). "Bridge Maintenance, Safety, Management and Life-Cycle Optimization: Proceedings of the Fifth International IABMAS Conference, Philadelphia, USA, 11–15 July 2010". CRC Press – via Google Books. ^ Morandi, Ricardo (30 May 1968). "Viaducto sobre el Polcevera, en Génova, Italia". Informes de la Construcción (in Spanish). 21 (200): 57–88. doi:10.3989/ic.1968.v21.i200.3892. ISSN 1988-3234. ^ a b Frangopol, Dan; Sause, Richard; Kusko, Chad (7 July 2010). Bridge Maintenance, Safety, Management and Life-Cycle Optimization: Proceedings of the Fifth International IABMAS Conference, Philadelphia, US, 11–15 July 2010. CRC Press. ISBN 9780415891370. ^ a b "Understanding Morandi - Part 1 - The Post-Stressed Conrete Cable Stays". retrofutur.org. Retrieved 18 August 2018. ^ "Genova: crollo del ponte Morandi. Era stato inaugurato 51 anni fa" [Genoa: collapse of the Morandi bridge. It was officially opened 51 years ago]. Corriere della Sera (in Italian). 14 August 2018. Retrieved 14 August 2018. ^ Enzo Boldi (14 August 2018). Giornalettismo, ed. "IL PONTE MORANDI ERA DEFINITO UN 'VIADOTTO MALATO' E SEMPRE SOGGETTO A LAVORI DI MANUTENZIONE" [The Morandi Bridge was termed a 'sick' Viaduct and always subject to maintenance work] (in Italian). Retrieved 14 August 2018. ^ Harlan, Chico (15 August 2018). "'Should not happen': Italian officials look for answers after dozens dead in bridge collapse". The Washington Post. Retrieved 15 August 2018. ^ Morandi, Riccardo (1979). "The long term behaviour of viaducts subjected to heavy traffic and situated in an aggressive environment: the viaduct on the Polcevera in Genoa" (PDF). Archived from the original (PDF) on 18 August 2018. ^ "Ing. Camomilla: come e perché intervenimmo senza demolirlo sugli stralli della pila 11 del Ponte Morandi nel 1992". ingenio-web.it (in Italian). Retrieved 3 October 2018. ^ "Ponte Morandi, ispezioni su stralli erano fallite: Ministero ha approvato un progetto incompleto". l'Espresso (in Italian). 21 September 2018. Retrieved 3 October 2018. ^ a b c "Ignored university reports about Morandi bridge: "Deformed pylons and oxidized cables"". La Stampa (in Italian). Retrieved 18 August 2018. ^ Sara Frumento (14 August 2018). "Ponte Morandi a Genova, una tragedia annunciata?" [Morandi Bridge in Genoa, a tragedy foretold?]. INGEGNERI.info (in Italian). Retrieved 14 August 2018. ^ "Detail view – Part of reinforced pylon number 10. The steel sheathing has been added 1993 and later. Pylon 9 did not receive this upgrade". retrofutur.org. Retrieved 18 August 2018. ^ a b "Genova, crollo del ponte autostradale, nel mirino i cavi di cemento armato. A maggio bando di gara per sostituirli". la Repubblica (in Italian). 14 August 2018. Retrieved 15 August 2018. ^ a b "Italy bridge collapse serves as a cautionary tale on older bridges". The Christian Science Monitor. 16 August 2018. ISSN 0882-7729. Retrieved 18 August 2018. ^ Otaola, Juan (1982). "Replacing Corroded Cables on a Cable-Stayed Bridge". Civil Engineering—ASCE. 52 (9). ^ "Maracaibo, 1964: El otro puente de Morandi siniestrado". eldiario.es (in Spanish). Retrieved 18 August 2018. ^ "Investigation of Corrosion Protection Systems for Bridge Stay Cables". citeseerx.ist.psu.edu. Retrieved 18 August 2018. ^ "Beyond Engineering: The Politics of Maracaibo – ProQuest". search.proquest.com. Retrieved 18 August 2018. ^ a b c "Crollo Ponte Genova, tiranti ridotti del venti per cento: Ministero e Autostrade sapevano". l'Espresso (in Italian). 19 August 2018. Retrieved 20 August 2018. ^ a b c Glanz, James; Pianigiani, Gaia; White, Jeremy; Patanjali, Karthik (6 September 2018). "Genoa Bridge Collapse: The Road to Tragedy". The New York Times. Retrieved 8 September 2018. ^ "Ecco la crepa su Ponte Morandi due giorni prima del crollo: video". Il Giornale (in Italian). Retrieved 18 August 2018. ^ "Autostrade per l'Italia ristruttura il viadotto del Polcevera a Genova" [Autostrade per l'Italia restructures the Polcevera viaduct in Genoa] (in Italian). 3 May 2018. Retrieved 14 August 2018. ^ "Ponte crollato, ecco il bando per i lavori di sostituzione dei tiranti ritenuti la causa del cedimento". la Repubblica (in Italian). 15 August 2018. Retrieved 18 August 2018. ^ Imarisio, Marco; Pasqualetto, Andrea. "Genova, ponte crollato: "Ci sono elementi di disagio", dicevano i tecnici di Autostrade ai cittadini". Corriere della Sera (in Italian). Retrieved 18 August 2018. ^ "Sul ponte Morandi non è stato fatto abbastanza". RADIO POPOLARE (in Italian). Retrieved 19 August 2018. ^ "Crollo Ponte Morandi, "anomalie sul pilone nove". Il Politecnico aveva avvertito Autostrade a novembre". Il Fatto Quotidiano (in Italian). Retrieved 19 August 2018. ^ a b Salawu, O.S. (1997). "Detection of structural damage through changes in frequency: a review". Engineering Structures. 19 (9): 718–723. doi:10.1016/s0141-0296(96)00149-6. ISSN 0141-0296. ^ GENTILE, C.; CABRERA, F. MARTINEZ Y (1 January 1997). "DYNAMIC INVESTIGATION OF A REPAIRED CABLE‐STAYED BRIDGE". Earthquake Engineering & Structural Dynamics. 26 (1). doi:10.1002/(sici)1096-9845(199701)26:1%3C41::aid-eqe622%3E3.0.co;2-u. ISSN 1096-9845. ^ Camomilla, G; DONFERRI, M; GENNARI SANTORI, A; MATERAZZI, L (1993). "REFLECTOMETRIC AND DYNAMIC MEASUREMENTS ON THE STAYS OF THE POLCEVERA VIADUCT IN GENOA (ITALY)". ^ "Genova, storia del ponte Morandi dalle polemiche al crollo". Retrieved 15 August 2018. ^ Alessandro D'Amato (14 August 2018). "La mancata manutenzione ha causato il crollo del ponte Morandi a Genova?" (in Italian). NeXt. ^ "Italy bridge operator in the spotlight as collapse death toll rises". The Times. Malta. 15 August 2018. Retrieved 16 August 2018. ^ Stone, Jon. "Genoa bridge collapse: Italy's governing populists wrote off safety fears as a children's 'fairy story' before disaster". The Independent. Retrieved 16 August 2018. ^ a b Molloy, David; Peter, Laurence; Palmer, Ellis (14 August 2018). "As it happened: Genoa motorway bridge disaster". BBC News. Retrieved 14 August 2018. ^ Taylor, Matthew (14 August 2018). "'Unusual' span of collapsed Genoa bridge had seen frequent repair work". The Guardian. Retrieved 14 August 2018. ^ "Ponte Morandi? Per il professor Brencich è "un fallimento dell'ingegneria", Genova". primocanale.it (in Italian). Retrieved 14 August 2018. ^ a b "Genova, crollo ponte Morandi: le vittime". La Repubblica. 15 August 2018. Retrieved 15 August 2018. ^ a b c d e "Italy bridge: Dozens feared dead in Genoa as motorway collapses". BBC News. 14 August 2018. Retrieved 14 August 2018. ^ "Crollo ponte Morandi, una testimone: tiranti spezzati insieme". Tgcom24. Retrieved 18 August 2018. ^ a b "Genova, crolla parte di un ponte sull'A10. Auto sotto le macerie: "Almeno venti vittime"" [Genoa, collapse of part of a bridge on the A10. Cars under the rubble: "At least twenty victims"]. La Stampa (in Italian). 14 August 2018. Retrieved 14 August 2018. ^ "'Dozens dead' as major road bridge collapses in Genoa". Sky News. 14 August 2018. Retrieved 14 August 2018. ^ "Italy's Autostrade was carrying out maintenance on Genoa bridge". Reuters. 14 August 2018. Retrieved 14 August 2018. ^ Observador. "As imagens da ponte Morandi minutos antes de colapsar em Génova". Observador (in Portuguese). Retrieved 18 August 2018. ^ "Exclusive | Collapsed Italy bridge investigators find corrosion on main stay cables". New Civil Engineer. Retrieved 18 August 2018. ^ "Death toll in Italy bridge collapse rises to 41". punjabnewsexpress.com. Retrieved 18 August 2018. ^ "Crollo ponte Morandi Genova, si continua a scavare: si cercano ancora 5 dispersi". Fanpage (in Italian). Retrieved 19 August 2018. ^ "Google Maps". Google Maps. Retrieved 19 August 2018. ^ "What are stay cables?". bbrnetwork.com. Retrieved 17 August 2018. ^ "Hoe kon de Ponte Morandi in het Italiaanse Genua instorten?". de Volkskrant (in Dutch). Retrieved 18 August 2018. ^ "In Italy Bridge Collapse, Both Design and Upkeep Are Under Suspicion". Retrieved 18 August 2018. ^ "Ponte Morandi: online la relazione della Commissione Ispettiva Mit | mit". www.mit.gov.it (in Italian). Retrieved 27 September 2018. ^ "Ponte Morandi, la Commissione: "Crollo dovuto a struttura, non a stralli. Autostrade ha minimizzato gravità della situazione"". la Repubblica (in Italian). 25 September 2018. Retrieved 27 September 2018. ^ "Ponte Morandi, ecco perché è crollato: il nuovo video choc con l'ult..." Oggi – Video (in Italian). Retrieved 27 September 2018. ^ "Ponte Morandi, la sorpresa dei magistrati per la relazione, prematura, della commissione Mit". la Repubblica (in Italian). 27 September 2018. Retrieved 30 September 2018. ^ "Ponte Morandi bridge collapses in Genoa during storm". Dezeen. 15 August 2018. Retrieved 17 August 2018. ^ "Dieci i ponti crollati in 5 anni: in calo la manutenzione e gli investimenti". Corriere della Sera. 14 August 2018. Retrieved 15 August 2018. ^ "Genova, si aggrava bilancio: 43 morti". adnkronos.com. ^ "Grief and anger at Italy bridge collapse". BBC News. 15 August 2018. Retrieved 15 August 2018. ^ "Former Cagliari keeper survives 'apocalyse' Genoa bridge collapse". Agence France-Presse. 14 August 2018. ^ "Italy bridge rescuers search into the night". BBC News. 14 August 2018. ^ Florentino, Michael-Ross; Rodriguez, Marta. "Morandi Bridge collapse: how to travel through Genoa now". Euronews. Retrieved 15 August 2018. ^ "Italy bridge: State of emergency follows Genoa disaster". BBC News. Retrieved 15 August 2018. ^ "Genova, crolla ponte Morandi sulla A10: "Sono 23 le vittime accertate". Precipitati 30 auto e 3 tir: si cercano dispersi. Aperta inchiesta per omicidio e disastro colposi" [Genoa, Morandi bridge collapses on the A10: "26 victims are ascertained". Rushed 30 cars and 3 trucks: they are looking for missing. Open investigation for murder and culpable disaster]. Il Fatto Quotidiano (in Italian). 14 August 2018. Retrieved 14 August 2018. ^ "Minute's silence for Genoa victims". Football Italia. 14 August 2018. ^ "Official: Sampdoria, Genoa matches off". Football Italia. 16 August 2018. ^ "Italy motorway bridge collapses over Genoa, 'dozens' feared dead". Reuters. 14 August 2018. Retrieved 14 August 2018. ^ a b Schumacher, Elizabeth (18 August 2018). "Italy mourns Genoa bridge victims at state funeral". Deutsche Welle. Retrieved 19 August 2018. ^ "State funeral for Italy bridge victims". BBC News. 18 August 2018. Retrieved 18 August 2018. ^ Willsher, Kim; Tondo, Lorenzo; Henley, Jon (16 August 2018). "Bridges across Europe are in a dangerous state, warn experts". The Guardian. Retrieved 16 August 2018. ^ "It is not just in Italy that bridges are failing". The Economist. Retrieved 16 August 2018. ^ "Transport – Infrastructure investment – OECD Data". theOECD. Retrieved 19 August 2018. ^ Pucciarelli, Matteo (18 August 2018). "I watched and wept in Genoa's ruins. But we have no idea what will happen next | Matteo Pucciarelli". The Guardian. Retrieved 18 August 2018. ^ Rankin, Jennifer (16 August 2018). "Brussels rejects Italy's claim bridge collapse linked to EU spending rules". The Guardian. Retrieved 18 August 2018. ^ Pica, Paola. "Lo choc dei Benetton. A Genova i manager chiederanno scusa". Corriere della Sera (in Italian). Retrieved 18 August 2018. ^ "Genoa collapsed bridge that left 43 dead to be rebuilt within eight months". Sky News. Retrieved 20 August 2018. ^ "Ferrazza e Brencich lasciano commissione (Dopo le polemiche sulla loro posizione)" [Ferrazza and Brencich leave the commission (After the controversy over their position)] (in Italian). 23 August 2018. Retrieved 23 August 2018. ^ Lami, Paolo (14 August 2018). "L'autista: "Il ponte Morandi crollato davanti a me, ho visto le auto precipitare"" [The Driver: «The Morandi bridge collapsed in front of me, I saw the cars fall»] (in Italian). Secolo di Italia. Retrieved 15 August 2018. Wikimedia Commons has media related to Viadotto Polcevera. This page was last edited on 7 April 2019, at 16:34 (UTC).